Emerson Manor is an elegant 1926 home located in central Oshawa. Oshawa is a cosmopolitan city with a metropolitanpopulation of 332,000 people. 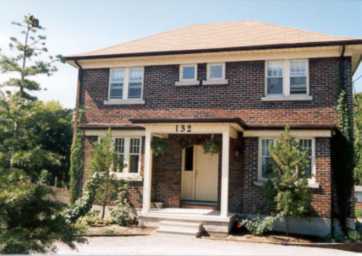 In 1997 the house was slated for demolition. At that point the house was purchased and moved six city blocks to its new location. Most of 1998 was spent restoring and renovating. Today, there are three bedrooms available to the traveler to choose from, all with the privacy of their own bathroom, and comfort of central air conditioning. The rooms are all decorated differently, but for the most part, reflect a Victorian motif, which includes hardwood floors, antique furniture, and Italian ceramic tile. Emerson Manor is a five minute walk from the Oshawa Shopping Centre, the area's major shopping mall, with over 350 stores and services. Just around the corner you will also find restaurants that range from fast food to fine dining. In the valley behind Emerson Manor you can stroll along a path that circles a pond teeming with wildlife. Quite often one can spot the elusive Great Horned Owl and Sharp-Shined Hawk, as well as the more common Cardinal, Blue Jay and Canada Goose.